Updated, 10:11 a.m.: Clarification regarding Mayor’s Ball proceeds. East Norwalk real estate developer Winthrop Baum “is taking steps to transform his 265,000 square-foot commercial property at 25 Van Zant Street into a state-of-the-art ‘IoT’ smart building,” according to a Thursday press release. “The internet of things, or IoT, is a system of interrelated computing devices, mechanical and digital machines, objects, animals or people that are provided with unique identifiers (UIDs) and the ability to transfer data over a network without requiring human-to-human or human-to-computer interaction,” IOT agenda explains. 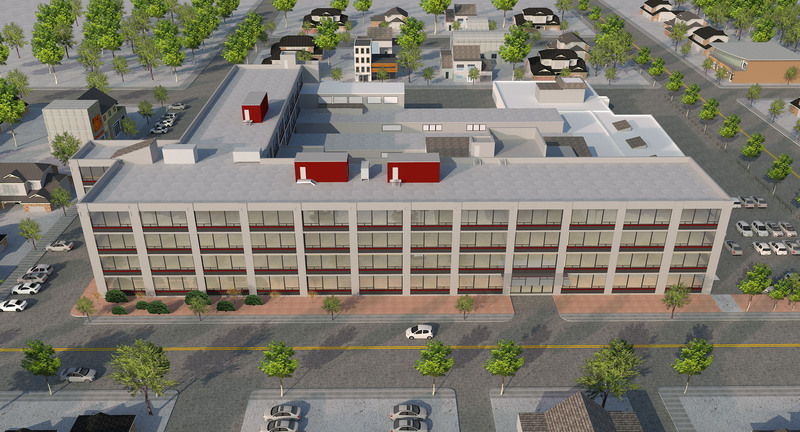 Before the revamp, Baum also pioneered an urban farm in part of the building which he unveiled publicly in the fall. Baum in November said he and his team were developing “cutting edge” techniques to offer hydroponic lettuce, basil, arugula and bok choi to Norwalk residents and businesses. Mayor Harry Rilling on Thursday presented two donations of $25,000 each to the Norwalk Domestic Violence Crisis Center and Literacy Volunteers, the two nonprofits that were selected as the beneficiaries of the 2019 Mayor’s Community Ball, a press release said. “We are overwhelmed by this support,” Norwalk DVCC Board Chairman John B. Watkins is quoted as saying. “Literacy Volunteers, a program of the Norwalk Public Library Foundation, teaches adults to read, write, speak and understand English so that they may achieve their personal, educational, employment and civic goals. Monthly, they serve approximately 450 students who hail from over thirty countries. Some students are well-educated and others have had little access to education; however, all share the same goals of wanting to improve their English to better their lives and become better advocates for themselves and their families,” the release said. The 26th annual Mayor’s Ball was organized by a volunteer Committee led by Chairwoman Sally Johnson, Maritza Alvarado, Irene Dixon, Charles Hankerson, Helen Kanganis, Donna King, Laoise King, Rebecca Kovacs, Sheila Miller, Josh Morgan, Morgan Rochefort and the Rillings. The Norwalk Fire Department held a promotional and swearing in ceremony last week at Norwalk Fire Headquarters. 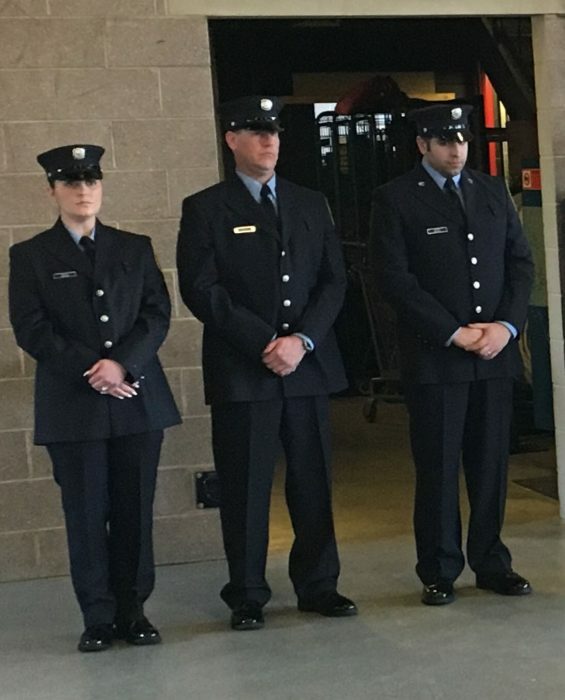 Probationary Firefighters John Pomponio, Madeline Jankowski, and Gregory Petriccione were officially sworn into the Department and Firefighter Jesse Granton was promoted to Fire Inspector after eight years of service, according to a press release. Fire Chief Geno Gatto, and Assistant Chief Chris King presided over the ceremony, while Mayor Harry Rilling and Pastor Oscar Destruge and Larry Bentley, both Fire Commissioners, read the oaths of their positions. Kristen Curran joined the Norwalk Police force in late February. She previously served for three years on the University of Connecticut Police Department. “Officer Curran has a degree in finance from Fairfield University and has a brother who is a police officer in New York. Officer Curran will be assigned to the Patrol Division upon completion of the Field Training Program,” according to a statement. All good news, especially the Mayor’s Ball checks to the non-profits. It was a fun party for two good causes! Having the Norwalk Mayor’s Ball in Stamford! Great endorsement for Norwalk – NOT!! Milly, Norwalk does not have a venue large enough for the event. Milly, I thought the same thing. I attended the Ball some time ago then have considered the past 2 years but decided Stamford would be out of the running for me due to distance and well, it’s Stamford not Norwalk for a Norwalk celebration. Also a great option as it has 120 hotel rooms. 580 in 2017, 350 in 2018, not sure on 2019 so something tells me maybe it is costs/proceeds they can clear. A clarification has been added above.